The Sun is the most important star of the solar system and around which the planets rotate which means they can receive all its benefits. It is the symbol of life: it gives strength and energy and being able to define the exact solar time is very essential for human beings. 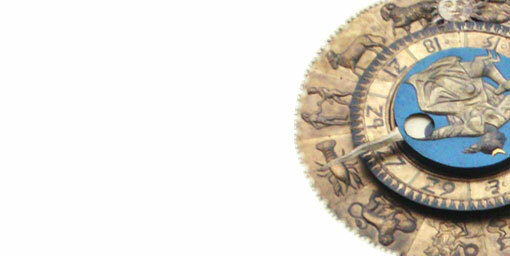 With our Zodiac Sundial, you can find out the exact solar time at any moment. Don't waste any more time! 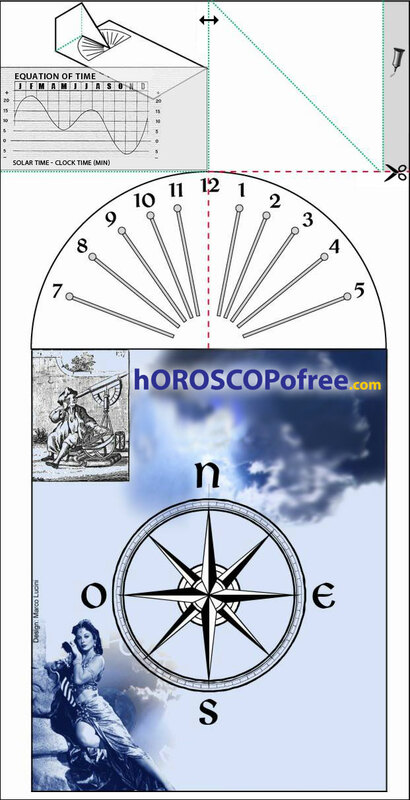 Download the image on your computer and follow the instructions to obtain your personal Zodiac Sundial! There are innumerable cults (some still alive) devoted to this star, symbolizing positive power and energy. The existing relation between the movement of the Sun and the Moon and all the stars become evident soon. Thus the first prehistoric attempts of geometrical interpretation of time arose, through the construction of orientated megalithic structures (Menhirs). The Sundial of Horoscopofree gives you the opportunity to enjoy the thousand year old relationship between men and the stars. The shadow projected over the quadrant as a simple and direct effect of the light coming from our nearest star - the Sun, will show you the time. Next open the file.jpg with any graphics application. After that you should print it, possibly a colour print on a pasteboard. It should be printed in size 10.5x21 cm. Now you should cut along the black frame, then along the two red dotted lines and fold the upper part of the pasteboard, along the green lines, as indicated in the scheme. Stick the flap on the part bellows the meridian. When you put the quadrant on a horizontal surface and line it up with the help of a compass. The shade that is formed will indicate the Local Solar Time. The civil time indicated by our watches diverges from the solar time, because of some astrological and geographical factors, but thanks to the graph of the local equation in minutes (reproduced on the meridian) we can add or subtract from the solar time the value in minutes produced from the equation, in order to obtain the exact time. Of course, during the period of the Summer Time, you should add 1 hour. Horoscopofree makes its best wishes for "maximum punctuality" to all the members of its Community!